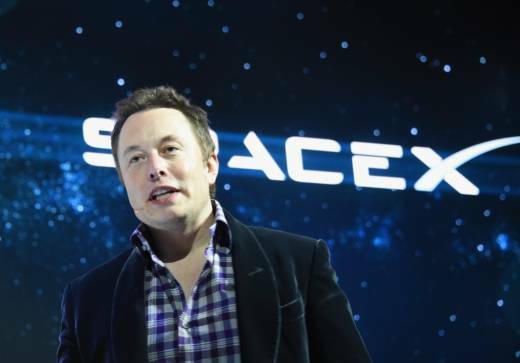 Elon Musk, founder of SpaceX, surprised pretty much everyone recently when he revealed that sometime late next year, the company will use one of its unmanned spacecraft to fly two lucky, unnamed wealthy space tourists all the way around the moon, into deep space and back again. It’s historic in many ways — not least because it would be the first time in more than 40 years that any human has gone that far into space. And the logo on the rocket will be SpaceX, not NASA — a fact that is lost on no one. The announcement raises interesting questions about the state of space tourism and private space exploration. For answers, we turned to Seth Shostak, Senior Astronomer with the SETI Institute in Mountain View. He sat down with KQED Morning News anchor Brian Watt. Watt: So if this mission goes as planned, it would be the first time in 45 years any human has gone this far into space. This would be a remotely piloted spacecraft. When was the last time we went to the moon, and why haven’t we been back? Shostak: That was the Apollo mission in 1972, and it was the last time anyone went any distance farther than the distance between San Francisco and Los Angeles, into space. So this is a big thing. It’s 1,000 times farther. When the Apollo program ended, the assumption was, we’d done what we wanted to do, which was largely geopolitical — we wanted to beat the Russians to the moon, and we did that. And after that, the financial incentive to do more than that kind of faded away. There was a plan to send at least three more manned missions to the moon — they didn’t happen. So that hasn’t happened. We haven’t sent people any farther into orbit. And I think that on some level, the public is aware that we haven’t done anything spectacular in space for a very long time. Watt: Has Mars essentially usurped the moon as our destination of choice? Shostak: I think so. The moon is only 240,000 miles away, which is more or less what I have on my Honda. Mars, on the other hand, is like 30 million miles away. That’s a much bigger trip. You can get to the moon in a couple of days. To get to Mars would take you half a year. And Mars has attractions that the moon doesn’t have. Mars was once a kinder, gentler world with waters on the surface — rivers, lakes, maybe even oceans. It may even still have life under the surface. None of that can be said for the moon. Mars is a more interesting, if a more difficult, target. Watt: So what does it say about the state of space exploration that a private company is getting astronauts back to the moon before NASA can? Are we going to see more of this kind of private space travel, do you think? Shostak: I kind of hope that we will, actually. The idea that NASA may over-engineer some things or that they’re too conservative – these may be legitimate complaints. NASA is sensitive to the fact that when it kills a couple of people, there’s a big reaction. And private industry doesn’t have that problem yet, because it hasn’t killed anybody. But space is dangerous. I think you liken it to aviation – after the Wright brothers, for many years it was basically a U.S. Army project to develop aircraft. But if the government had stayed the sole developer of airplanes, it would cost you a lot of money to go anywhere in an aircraft today. The private sector got involved, they were able to drive down costs and commercialize it. Today, you can buy an airline ticket for what some people would consider a reasonable price. I think the same thing may happen in space. If you’re really going to open up space to more people than just a few astronauts every year, then privatization’s a good thing. Watt: You touched on something very important. SpaceX has never flown people before, and it actually has had two rockets blow up in the last two years. Are there some unique risks to a mission like this because it involves a private company? Shostak: Well, there is the question of, do you trust their engineering, have they done enough testing? That sort of thing. It seems easy to build rockets in the movies, it always works. But in real life, it’s not what you would call a mature technology. So there is that danger. And there’s also the case that if you’re going to send somebody up a couple of hundred thousand miles into space – if they get into trouble up there, it’s very, very hard to get them back. It’s really tricky, because they’re so far away. If you send them up into orbit — and there’s been plenty of talk about sending tourists into orbit around the Earth — they’re only a couple of hundred miles away. So if they get into trouble, you might be able to bring them back right away. If you’re on the back side of the moon, sailing through space out there, it’s hard to do anything. Watt: We still don't know who's going to be on this flight. The Falcon Heavy rocket system that would launch these tourists into space costs $90 million dollars by itself, without factoring in the riders. How much could we expect something like this to cost? And what kind of space tourist can afford something like this? Shostak: The estimates I’ve seen are in the millions of dollars. That’s a lot of money to spend on an interesting weekend. If you’re a billionaire — and there are plenty of billionaires these days — then you’re talking about one-thousandth of your annual income to make this ride. If it cost $3 million to go and see the moon, I think you’d have people every weekend who’d want to go. Watt: So, drawing on your expertise here: How long would a trip around the moon and back take, and is there a trajectory through space you need to take to get there? Shostak: Generally you choose the trajectory that involves the least amount of energy, meaning fuel. Keep in mind that the moon is moving around in space, so whatever way you’re going to go to the moon, you have to loop around a moving target. But we have plenty of experience doing that. The moon is, as I mentioned, 240,000 miles away. This rocket will sail past the moon, and eventually the gravity of the Earth will bring it around, and bring it back to Earth, where it will land. It may go 300,000 or 400,000 miles from Earth. Watt: So if I’m a space tourist and my check doesn’t bounce, I can tell my family, “I’ll see you in a few days”? Shostak: Well, there’s no guarantee you’ll see them in a few days, but probably you will. I have to point out that the Russians, have been taking people to the International Space Station for years, and the tab for that is $20 million. So this is a lot farther. It sounds like a deal to me.